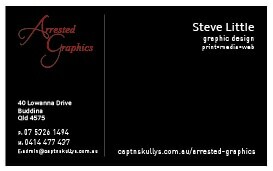 To provide a "Complete" image when "branding" your business is extremely important ! When a business sets this image at "Start-up" and carries it through to everywhere the business is seen, be it print, media or web, they begin to grow the "instant recognition" of their Brand. This is how companies such as McDonalds and Coca Cola have grown their market share over the years. The opportunity to do this from the beginning happens only once. So why not contacts us and make use of our expertise in guiding you through the "setup" process? We have a full Graphic Design Service utilizing the latest Adobe and Corel Software. We offer a large variety of Graphic Design services and can follow through from the initial design process right up to the "finished" product. We have reasonable prices and often have "Specials" We can supply Business Cards, DL Leaflets as well as all Customised Office Stationery. We have a full signage design and production service for buildings, offices, shops and vehicles with Large Format Colour Print or Computer Cut Vinyl. Please feel free to contact us anytime between 8.30am and 6.30pm, 7 days a week for more information.